HOUSTON, TX--(Marketwire - July 31, 2008) - Frontera Resources Corporation (London Stock Exchange, AIM Market - Symbol: FRR; OTCQX Market, U.S.A. - Symbol: FRTE), an independent oil and gas exploration and production company, today announced an update of its operations at the Taribani Field Unit within Block 12, Georgia. After the completion of fracing operations at the Dino #2 development well during the last week of April and the T-#45 well during the last week of May, both wells have undergone extensive, long-term production testing as part of a larger field-wide effort to enhance production by applying artificially induced fractures to objective Zone 9 reservoirs at a depth of approximately 2,300 meters. Frac completions are designed to enhance well flow-rates and ensure sustainability of production. 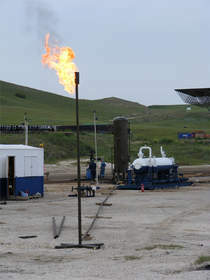 Production testing has been ongoing at various flowrates and pressure drawdowns since the wells were initially completed, and they have continued to yield sustainable production of 36 degree API oil with no associated flow of sediment, an occurrence that has previously presented a challenge to sustainable production from wells at the Taribani Field. In addition, no formation water has been produced. The first in a series of planned development wells, the Dino #2 and T-#45 wells are flowing oil from Zone 9, an oil-producing reservoir interval that was hydraulically fraced at both locations at a depth of approximately 2,300 meters. Based on data obtained from production testing to date at both wells and following successful completion of planned testing and optimization programs, Frontera is planning to put the Dino #2 well and the T-#45 wells into optimized production at expected rates of approximately 200 bbls per day and 130 bbls per day, respectively. The next scheduled development well is the Taribani South #1 well. A rig is currently mobilizing on location from within Block 12 and the well is expected to commence drilling in early September and take approximately forty five days to drill and test. The Taribani South #1 well is designed to be completed in Zone 9 at a depth of approximately 2,200 meters and will also test Zones 14 and 15 at depths of approximately 2,400 meters and 2,500 meters, respectively. Situated approximately 100 meters up-dip to the Dino #2 and T-#45 wells and approximately 300 meters up-dip to the lowest known oil in Zone 9, this well will be the first to be drilled near the crest of the Taribani Field structure and is expected to further delineate the size of the field. "Our ongoing work at the Taribani Field Unit continues to meet our expectations, and we are very pleased that we have continued to confirm our ability to sustainably produce oil without associated sediment or water production from our recent completions as this represents an important achievement in our work to develop Zone 9. In addition, our focus will now turn to drilling of the Taribani South #1 well that represents an important continuation of drilling at a very strategic and technically attractive location within the Taribani Field. From our ongoing and planned work, our goal is to exit the year with daily production rates of 500-1,000 bbls per day from the Taribani Field Unit." The Taribani Field is a large, undeveloped oil field covering an area of approximately 80 square kilometers with productive horizons situated in Miocene and Pliocene age reservoirs. These reservoirs are located at depths between 2,200 meters and 3,500 meters. The independent consulting firm of Netherland, Sewell & Associates has assigned 118 million barrels of P3 reserves from Zones 9, 14, 15 and 19 within the field. Additionally, Netherland, Sewell & Associates has assigned as much as 36 million barrels of unrisked resource potential associated with five deeper horizons in the field. 1. Frontera Resources Corporation is an independent Houston, Texas, U.S.A.-based international oil and gas exploration and production company whose strategy is to identify opportunities and operate in emerging markets around the world. Frontera has operated in Georgia since 1997 where it holds a 100 percent working interest in a production sharing agreement with the government of Georgia. This gives Frontera the exclusive right to explore for, develop and produce oil and gas from a 5,060 square kilometer area in eastern Georgia known as Block 12. Frontera Resources Corporation shares are traded on the London Stock Exchange, AIM Market - Symbol: FRR and via the Over-the-Counter Market, U.S.A. - OTCQX Symbol: FRTE. For more information, please visit www.fronteraresources.com. For more information regarding Frontera's work at the Taribani Field, please visit: http://www.fronteraresources.com/operations/taribanifieldunit.php. 2. The reserve information herein was determined by the independent consulting firm of Netherland, Sewell & Associates in accordance with the petroleum resource definitions adopted by the Society of Petroleum Engineers (SPE), World Petroleum Council (WPC) and the American Association of Petroleum Geologists (AAPG) in 2000. 3. This release contains certain forward-looking statements, including, without limitation, expectations, beliefs, plans, goals and objectives regarding the potential transactions, potential drilling schedule, well results and ventures discussed in this release, as well as reserves, future drilling, development and production rates. Among the important factors that could cause actual results to differ materially from those indicated by such forward-looking statements are: future exploration and development results; availability and performance of needed equipment and personnel; seismic data; evaluation of logs and cores from wells drilled; fluctuations in oil and gas prices; weather conditions; general economic conditions; and the political situation in Georgia and neighboring countries. There is no assurance that Frontera's expectations will be realized, and actual results may differ materially from those expressed in the forward-looking statements.